As part of our strong commitment to creating an inclusive, welcoming environment for learning, teaching, and expression, the University of Oregon encourages Native American students to apply for admission. Through a variety of programs, services, and initiatives, the UO seeks to create a welcoming and supportive campus atmosphere for Native American students. This summer academy aims to create a cohort of college-bound indigenous students from Oregon. Over the course of this eight-day program, the students will get acquainted with the UO's campus, facilities, students, and staff. We want to foster an early sense of comfortability on college campuses that will make the transition into higher education that much easier for our students. Students will stay in our new Kalapuya Ilihi residence hall and get first-hand experience living and learning on a college campus. The Native American and Indigenous Studies (NAIS) Academic Residential Community is for students interested in delving into the issues facing indigenous communities, as well as exploring solutions to those challenges. NAIS residents live in the newly built Kalapuya Ilihi Hall. Students interested in being part of NAIS must apply to this residential community. The UO offers in-state tuition to all members of the tribes and bands that have a historic relationship to the land that became Oregon regardless of their current state of residence—a savings of over $20,000 per year. 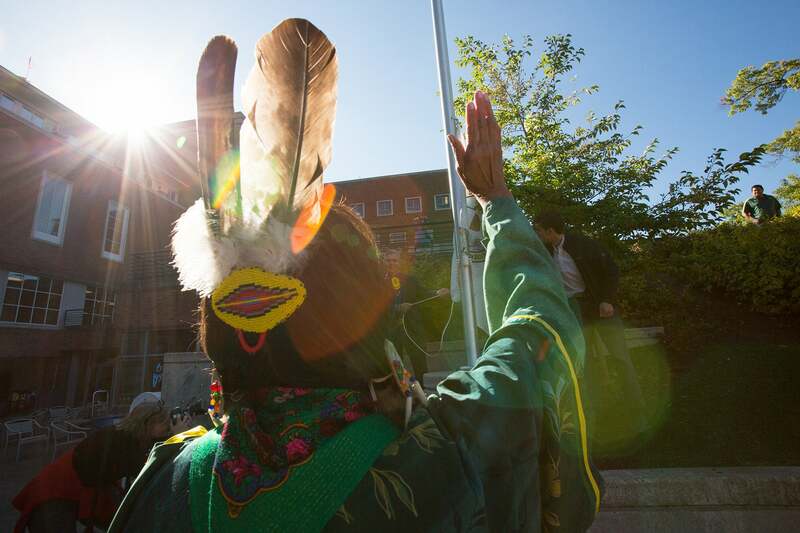 The UO offers a minor in Native American studies. The UO has an active Native American Student Union (NASU). The Diversity Excellence Scholarship recognizes the academic achievement and potential of students who, through sharing their varied cultural perspectives, will enhance the education of all students and the excellence of the university. The Native American Student Union organizes an annual Mother’s Day celebration and pow-wow. The beautiful Many Nations Longhouse, which is used for personal, cultural, social, and academic events, is the oldest continuously operated longhouse on a college campus in the Northwest. The Northwest Indian Language Institute offers Sahaptin and Tolowa dialect studies. Academic resources and cultural support for Native American students through the Division of Equity and Inclusion, and TRiO programs. The Pacific Northwest Tribal Climate Change Project within the Environmental Studies Program offers UO students the opportunity to take on internships and research positions examining how tribes can be involved in tackling climate change. The College of Education's Sapsik'walá Project is a master's program that trains Native American students to become professional educators, allowing them to help their communities by returning to teach in Native schools. The Native American Law Students Association promotes the study of Indian Law and traditional forms of government. The Opportunities program presents workshops at schools and community centers that address concerns for both students and parents, such as financial aid and scholarships, essay writing, deadlines, ACT and SAT tests, the admissions process, and the natural fear of going away for college. UO Connections is a half-day college advocacy program designed for first-generation, ethnically diverse, or economically disadvantaged high school students in ninth through twelfth grades. The program provides valuable college prep information. At the UO, you’ll make connections with Native American faculty and staff across campus.